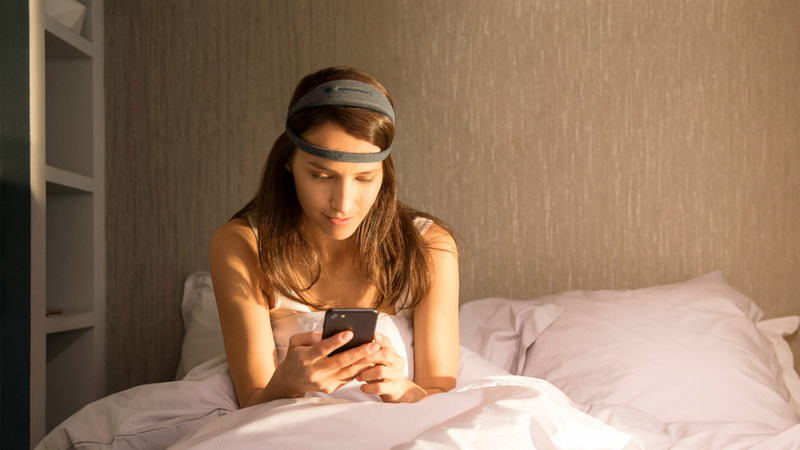 Last year, French-American startup Rythm ran a beta program for a headset that tracked both the user's sleep quality and helped induce a better quality of sleep. Now, after a few tweaks and adjustments, it's announced the Dreem is finally ready to go. Many sleep trackers track the user's movement, some use heart rate, and a few use breathing frequency. Dreem does all of the above, but most importantly it also monitors brain activity using Rythms neurotech, and CEO and co-founder Hugo Mercier claims it's accurate to professional lab equipment by 95%. But what makes Dreem most interesting isn't how it tracks your sleep, but how it promises to improve it. The Dreem has features that will help you drift off, such as relaxing sounds or a sequence of words softly spoken out to help take your mind off life's stresses. It will also match sounds to your breathing rhythms, which is meant to help calm you and help you drift off faster. "On average we are reducing the sleep onset latency by 45%" Mercier told us, quoting research data based on 500 people from its beta trials. Rythm claims the headset will also help boost your deep sleep, and this feature should be good for everyone - after all, deep sleep is where many of the body's restorative processes take place. It'll work by stimulating your brain with sounds through bone conduction to lengthen your deep sleep cycles, which tend to contract as the night goes on. Since the beta, Rythm has made the headset smaller and more comfortable to wear with a fabric material to make it softer. There's also a touch bar on the front that lets you adjust certain settings like volume without touching your smartphone. While we haven't been able to put it to the test yet, we tried it on for fit and it's perfectly comfortable, though it will probably take a few nights to get used to having it on your head. Mercier said the headset will run for about 15 hours max so you'll need to charge it each day. We've also had a look at the app, which will let you set all sorts of configurations to help you fall asleep faster. Each morning this will deliver a sleep score (which looks quite like the one found in the Beddit app) and it'll take into account any features you used to help you drift off. If something seems to be working, it'll recommend you continue using it. You'll also see your trends over time and how your quality of sleep has got better - or worse - over the weeks and months. The Dreem costs $499 and pre-orders are now live, with units shipping this summer. Rythm is also offering an 'early bird' deal where anyone who orders a headset by 15 July will get it for $399 instead.